Burbank, California is a place where entertainment dreams come true. Burbank was once the television capital of the world, and it still retains a strong hold on the entertainment industry. This bustling city is home to many different types of industries, and it also has a residential community that is very active. 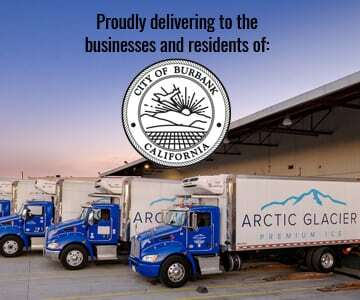 Arctic Glacier is the kind of ice delivery company that can keep pace with the needs of a place like Burbank. It has the logistics knowledge of Burbank to provide the entire city with its particular ice needs. It takes a lot more than just water and electricity to make good ice. First, it takes the kind of quality water that Arctic Glacier sources from all over the world. Second, it takes a filtration system like the one Arctic Glacier uses to remove any remaining imperfections. There is a big difference between tap water ice and professionally made ice from Arctic Glacier. That is why so many businesses and private residents of Burbank rely on Arctic Glacier for their ice needs. We have years of experience in servicing all of the industries that use ice on a regular basis, and we can fit your ice needs exactly. Our crushed ice, standard ice, dry ice and classic vintage cubed ice is made to your needs and delivered on a regular schedule. We also create custom ice sculptures and make artificial snow that will enhance any event. Our experts can work with you to determine how much of each type of ice you need to meet your daily needs. We can also create a delivery schedule that will keep you loaded with ice and ready to serve your customers. If you have special events that will require extra ice, then let’s talk about it. We’ll make sure that we deliver that extra ice right when you need it. It is our job to keep you in ice and then make sure your special ice needs are met. Arctic Glacier prides itself on being a reliable and professional supplier. To the professionals at Arctic Glacier, a home graduation party is just as important as the weekend community festival. The last thing you want to do is run out of ice during your special event, and that is why your first call when planning your event should be to us. We will work with you to calculate and plan all of your ice needs and make sure that your special event goes off without a hitch. When it comes to delivering the right type of high-quality ice all around Burbank, Arctic Glacier is the company to call on. We invite you to contact one of our expert associates today to talk about your regular ice needs, and to see how we make planning any size event easy.